If you're after a top-end Windows phone, Microsoft has finally brought out something worth checking out. It's been many years since we've seen something that's got our juices flowing in the mobile work with Microsoft's name on it, but its new pair of handsets might have done just that. The Microsoft Lumia 950 has a 5.2-inch 1440 x 2560 QHD screen, a hexa-core processor, 20MP PureView rear camera complete with optical image stabilisation, a 5MP front-facing snapper, 32GB of built in storage and a microSD card slot with support for cards of up to 2TB. That's a lot of power for the phones that have traditionally been behind the spec curve compared to the top Android phones, but with Windows 10 on board the Redmond brand has stepped up its game. 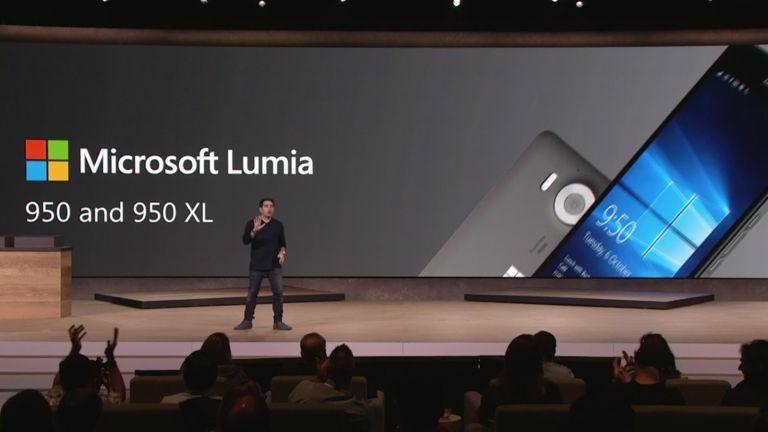 Joining the flagship 950 is the catchily-named Lumia 950 XL, which (as you've guessed) is a larger device – but comes with a more powerful octa-core processor and the same 3GB of RAM. Plus there's a 20MP PureView camera on the back with optical image stabilisation, a 5MP camera on the front, 32GB of storage and a microSD card slot, just like the Lumia 950. Both phones have USB Type-C ports that can charge to 50% within 30 minutes of being plugged in and even include face scanners so you can unlock your phone without even touching it. Sadly the design doesn't look up to much given they appear to be covered in lovely plastic – but hey, with liquid cooling on board perhaps you won't care as much. The new phones will be a little cheaper than their flagship rivals, starting at £450, and will be landing in your palms (should you go to a shop and convince an assistant to open the box and drop one in) from November.